Preview: The Scarlet Knights were better than anyone was expecting them to be in their first season in the Big Ten as Rutgers went 8-5 overall including an impressive 40-21 bowl win over North Carolina. Rutgers opened 2014 with an impressive road win over Washington State and that propelled a 5-1 start for the Scarlet Knights. Rutgers had their lumps in Big Ten play going 3-5 overall in conference with their best wins coming against Michigan and Maryland. Head coach Kyle Flood has done a commendable job leading the Scarlet Knights to a 23-16 record in his 3 years as the head man. Flood will have his work cut out for him in 2015 with only 10 returning starters. Rutgers brings in yet another new OC this year, but there won’t be much change from the pro-style system they deployed in 2014. The first question mark comes at the QB position where Rutgers needs to replace Gary Nova. The QB competition right now is between Laviano and Rettig and the competition is likely to continue through fall. Whoever wins the job will work behind an O-line that returns just 2 starters. Rutgers has strength at the skill positions with the WR group being led by Carroo who could have gone to the NFL in the offseason. The RB position is the strength of the team with guys like Peoples, Martin, Hicks, James, and Goodwin all with starting experience. Rutgers’ defense had a tough time hanging around with some of the elite teams in the Big Ten in 2014 and that figures to be the case again in 2015. The Scarlet Knights return just 5 players on the defensive side of the ball with some holes needing to be filled by some new faces. The D-line returns 2 starters and this unit will be led by Darius Hamilton who’s the heart of the defense. The LB position looks to be a strength on defense with 2 returning starters back and this unit will be led by Gause and Longa. The secondary brings back just 1 starter, but the former depth will fill in the holes as this group is built around Barnwell and Cioffi. Prediction: This will be the pivotal 4th season for head coach Flood and the fan base doesn’t want to see regression even with the depth chart needing to be rebuilt. The defense is very young and that’s scary going against a tough conference schedule. 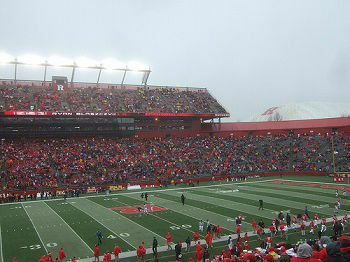 The Scarlet Knights are also looking for a new starting QB, but whoever starts will be surrounded by solid playmakers. A bowl game return could be in the cards for the Scarlet Knights, but getting back to 8 wins could be out of reach for this young rebuilding team.